Toy Fair, an industry trade show in NYC this week, is one of my favorite annual visits, because it’s a chance to be a big kid in a candy shop full of toys that the public has not yet seen. This year’s show feels a little recession strapped in that the toy manufacturers are packing volumes of value into their packages and not designing big expensive toys. There was a time when plush animals costing thousands were plentiful on the floor. Today’s show was a bit more austere but amazingly creative, which goes to show you that having less can sometimes be more. 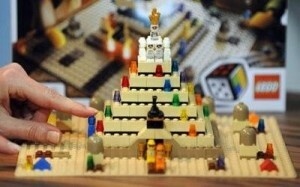 Lego: Lego introduced a new breed of board games at Toy Fair. Your job is to build the game out of Legos (and decide the rules of engagement) before you play. It’s a brilliant idea–a twist on the family board game, capturing the love of Legos. What a mashup! The digerati are awaiting Lego Universe, the company’s huge online world. Most of the games, like Pyramid (pictured here), are priced between $10 and $20. At the high end, Creationary costs $24. 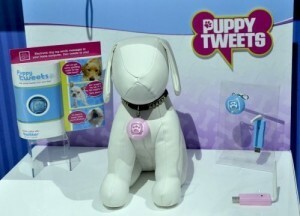 Mattel: Mattel’s star of the show was a dog collar aptly named Puppy Tweets. Once the collar is placed on the pup, he can send a tweet (or is it a woof directly to Twitter). The USB collar uses Bluetooth to communicate with Twitter so proximity is important. For $30 it’s pure unadulterated fun–a mashup of pets/gadgets and social media. You can follow your dog and have them make other doggie friends on Twitter. E-readers: I wondered when the first e-readers for kids would appear and they have. Systems like Leapfrog’s Tag Reader have been serving the function of e-readers for a long time. 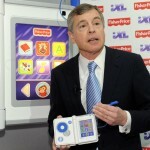 Fisher Price announced a super-duper 5-in-1 product called the iXL. It’s a 3- to 6-year-old’s rendering of My First iPod, combining a photo album, e-reader, notebook, game machine, and music player into one crash-proof device. Price: $80. TRAKR: One much buzzed about fave on the show floor was Wild Planet’s new Sky Video TRAKR. At the upper end of the price range ($129), this packed-with-technology gizmo is a toy that looks like a tank/robot. You control it with a gameplayer-like remote control that has a small LCD VGA-quality screen, joystick, and buttons. Using simple downloadable programs or even creating your own programs, the TRAKR transmits color video and audio and data. It can memorize a path to your kitchen or be trained to scare the pants of your mom when she enters your room. It’ll even have night vision just to make things interesting. Talkatoo: Of course some of the coolest products are found in the recesses of the Javits Center, usually start-up companies with some very passionate owners. For instance, there’s talkatoo–a small, colorful pendant that allows for a 30-second voice recording. For $16 bucks, you can carry your kids’ voices everywhere with you. TV Hat: Now here’s one that’ll have you laughing and shaking your head in amazement. 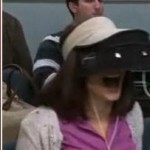 But no one will be able to see you because you’ll be under the TV Hat. This sub-$30 hat (or visor) has a tiny pouch for you to insert your iPhone or other video player. Underneath the hood, a prism brings the image into focus and built-in earphones create your own private studio. As long as you’re comfortable looking like a cross between a Klu-Klux Klan’er and a HAZMAT worker, you will fall in love with the TV Hat–a poor man’s solution to TV glasses. (Imagine each kid in your car wearing these in the back seat! You might get pulled over for kidnapping!) Of course it made the worst of show list over at http.bored.com, but it’ll either be the next pet rock or not. Geocaching: For the family that likes finding its way together, GeoMates Jr. from Apisshere is an entry-level $70 GPS. It’s filled with 25,000 geocache locations from all over the country. Geocaches are markers or hidden boxes or anything you want that you place somewhere and mark its coordinates on a GPS map. My Ami: Finally there’s My Ami–created by a mom after giving her kid an iPod and watching it tossed from the shopping cart one too many times. My Ami is a bear that conveniently holds the iPod or iTouch securely and out of harm’s way. There’s the suction cup version for strollers or car seats and the clamp-on for shopping carts. Advocates of less screen-time for little ones will go apoplectic over this one, but hey, for many moms, it’s whatever it takes to get you through the day. 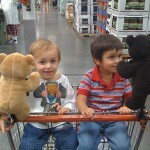 Posted: February 16th, 2010 under creativity, creativity and play, education, toys, TV, Your Digital Home, Your Digital Kids.